Team Northland pro staffers Steve Weickert and Joe Balcer sacked a 10-fish limit weighing 25 pounds, 2 ounces to win the Cabela’s Masters Walleye Circuit’s regular-season finale on Minnesota’s Cass Lake Chain September 16-17. Weickert, of Bemidji, and Balcer, of New York Mills, relied on Northland Fishing Tackle’s legendary Fire-Ball Jigs and live-bait rigging components to seal the deal and top the 98-team field. Weickert and Balcer opened the prestigious two-day team tournament with a 5-fish limit weighing 14 pounds, 14 ounces that would turn out to be the heaviest basket of the entire event. They added a 10-pound, 4-ounce limit on day two to cement their position atop the leaderboard. “It’s an amazing feeling,” said Weickert, who guides on Cass and religiously factors Northland tackle into his fishing strategies. “I was speechless,” added Balcer, a fellow Northland fanatic. 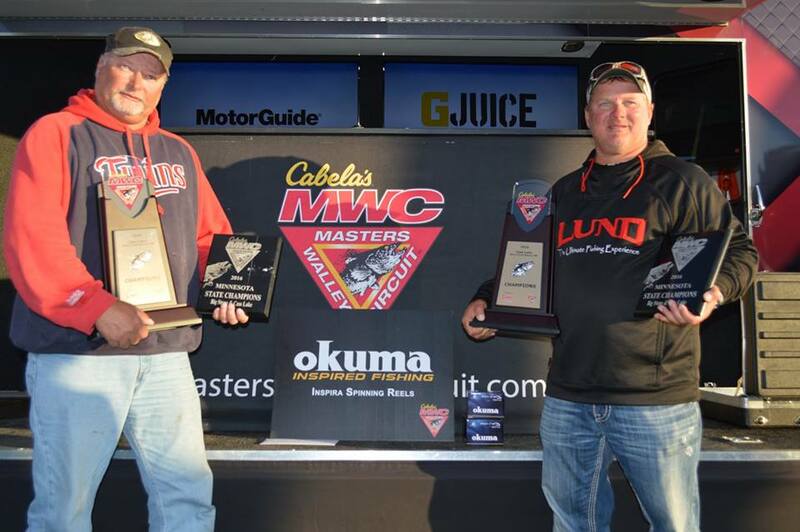 The hard-fishing duo put together a two-pronged plan of attack for the event, which drew teams from across the Midwest. They targeted cabbage beds lying in 12 to 14 feet of water for limits of fish, then turned their attention to deep, steep breaks along points for larger kicker fish (each angler was allowed to weigh one fish over 20 inches). Weickert reported that the best cabbage bite came on the outside weedline on day one. “When the wind came up on day two, however, the pike moved in and the walleyes shifted up onto the sand on the shallow side of the inside weedline in 6 to 8 feet of water,” he added. Along with earning serious bragging rights in Northwoods walleye circles, Balcer and Weickert won $14,700 in cash and prizes, plus an invitation to the 2017 Cabela’s National Team Championship. They also claimed the MWC’s title of 2016 Minnesota State Walleye Champions.